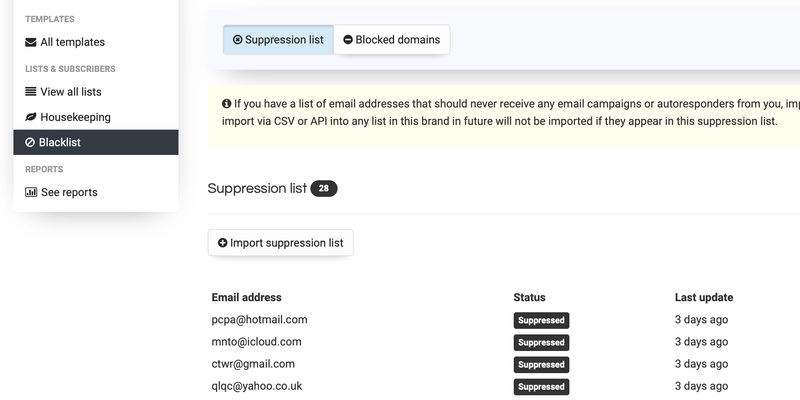 In future when you import a CSV and if there are email addresses matching those already marked as unsubscribed in the 'blacklist', they will not be imported. THANKS. it sounds perfect: btw when i use mass unsubscribe do the e-mail addresses remain in the database or are they completely deleted? when i use mass unsubscribe do the e-mail addresses remain in the database or are they completely deleted? They remain in the database, not deleted. When you re-import the same emails in future, any emails that were marked as 'unsubscribed' in the list or any other list in the brand, it will be skipped.